Pleasantville, New York: ImPress (Reader's Digest Association), 2005. This is the Reader's Digest Best Mysteries of All Time edition of Tony Hillerman's novel A Thief of Time, published in 2005. This is a hardcover book with no dust cover. The cover is black cloth. On the front cover, the title and author are embossed in pale orange metallic. Near the author's name is a kokopelli figure in red metallic. These items are surrounded by a red metallic rectangular border. Above this is the Best Mysteries of All Time logo. The back cover, inside front cover, and inside back cover are blank. The endpapers are orange. Binding: Black cloth-covered boards. 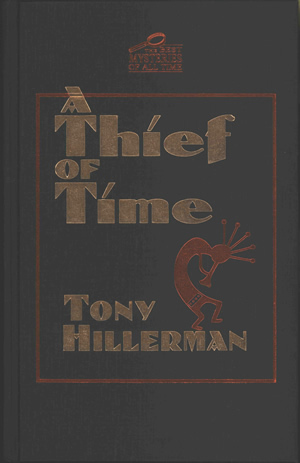 The author's name, a small kokopelli figure, the title, and "ImPress Mystery" are embossed on the spine in pale orange metallic, between rules of the same color.